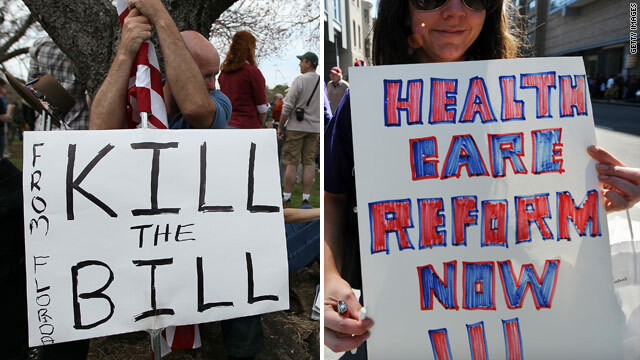 Protesters on both sides of the health care bill debate have voiced strong feelings. Former hospital financial manager says bill "isn't perfect ... but it will save lives"
Recent college graduate who's on chemotherapy hopes "this bill will help our situation"
Vicki Kennedy, widow of Sen. Ted Kennedy, talks about the historic health care vote on the premiere of "John King, USA," 7 p.m. ET on CNN. (CNN) -- The health care bill's passage has struck such an emotional chord that more than 10,000 people have posted comments and sometimes deeply personal stories about it on CNN.com. Under the bill, which President Obama is expected to sign Tuesday at the earliest, most Americans will now be required to have health insurance or pay a fine. Larger employers will be required to provide coverage or risk financial penalties. Total individual out-of-pocket expenses will be capped, and insurers will be barred from denying coverage based on gender or pre-existing conditions. Democrat Alison Victoria, who was a financial manager at a hospital for 15 years, supported the bill. As it's written, the bill "isn't perfect, and it's not everything I wanted, but it will save lives," Victoria said in an iReport video. "Doctors, nurses and financial officers see a part of our health care system that many Americans don't, if they're lucky," she said. "We have seen benefits denied based on false allegations that the treatment is not medically necessary. We have seen families and whole small businesses dropped from insurance coverage because one person on the plan got sick. We have seen people unable to find insurance because of a pre-existing condition," she said, likening the bill to a form of "justice" promised in the Constitution. Another reader used sarcasm to suggest that people will find a way around paying premiums. "This is cool. I'm just going to drop my insurance now, pay the $700 yearly fine, and then pickup insurance when I get sick since insurance companies can't deny me," he wrote on the Sound Off section of a CNN.com news story published after the bill passed. "I'll save a bundle of money every year." "I suspect this is what most 'smart' Americans will do," he continued. "And then guess what? Insurance companies will collapse because they'll have no pool of money to pay for the claims that start coming in, and we'll be in a world of hurt again." Many people who responded to CNN's coverage said they were happy the bill passed simply because the current system was not working. Government-backed health care is "the best compromise possible," Egberto Willies said. He's relieved that his wife, who has lupus, and his daughter, a pre-med student, won't have to worry about health care as much under the new bill, he said. "America has joined the civilized world," he said in his iReport video. iReporter Cameron Harrelson, however, said he is afraid that his generation will end up paying for the bill. "We're going to have to endure it the longest," the 15-year-old from Georgia said. Cliff Olney's daughter was born premature, and he's had to spend more than two decades caring for her with Medicaid, the U.S. health program funded by state and federal governments available to low-income people or people with disabilities. "After 22 years of fighting health insurance companies, me and my daughter have vindication," he told iReport. But he also thinks the fight is far from over. "You know what's going to happen now ... the insurance companies will begin to cut people who are sick as quickly as they can before the window of opportunity is over ... they'll also increase premiums as the banks did after legislation was passed for credit card reform." Michael Ingram, of Milford, Pennsylvania, says he's in good health and feels like he doesn't need health insurance. As a Navy veteran, he goes to a Veterans Affairs hospital when he's ill, he said. "Forcing me to take a health care package that I may not need is dictatorial and not in keeping with the spirit or a free nation," Ingram wrote in his iReport. He said he's written to his representatives about the bill and said both parties are a "sham." He plans to refuse to buy a health care plan. "I hope that everyone can give this [health care bill] a chance," wrote one CNN.com reader who identified herself as a 27-year-old recent college graduate who is working full time for a law firm and has health insurance through her job. Two years ago, she was diagnosed with two debilitating diseases that require chemotherapy twice a week and 19 prescription drugs at a cost of $660 a month after insurance, she said. She and her husband, who doesn't have health insurance because it would cost $1,000 extra to add him to her plan, feel like they can barely keep their heads above water. "The hardest thing for me, is that I know he has medical issues that go unattended because we simply can't afford it," she wrote. "We truly are a family that is one major illness away from financial disaster. So I hope this bill will help our situation, and the situations of people much less fortunate than ourselves."